A group of researchers at the National Institute of Standards and Technology (NIST) working with engineers from Colorado-based Scientech has developed a new approach to measuring laser power using a mirror and a scale. This method, which measures the force on the mirror driven by the radiation pressure of the laser light, presents a more rugged and more portable solution than current meters. 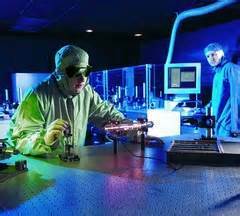 Since the early days of laser development, calorimetry has been used to measure laser power. The laser beam is directed into a sensor head that is typically filled with razor edges, light absorbent paint, and graphite foam, the object of which is to absorb as much of the incident laser light as possible. The laser power is then determined by measuring the rise in temperature of the sensor head, and comparing to a thermal model. Such calorimetric measuring devices work quite well for many applications. However, if the laser is very high powered (say greater than about 10 kW), they have a strong tendency to destroy the sensor head while heating it. Also, calorimetry in its pure form (i.e., when the entire beam is directed into the sensor head) prevents measuring the laser power while the beam is actually in use. In practice, measuring the laser power for purposes of process control usually requires that a small portion of the beam be split off with a beamsplitter to have its power measured, a procedure that is neither clean nor terribly accurate when used with industrial lasers. As an alternative, the NIST researchers decided to try to measure laser power by measuring the force generated by laser photons on a reflective plate. The advantage here is that when the laser bounces from a reflector, 99+ percent of the incident light proceeds on to whatever process (cutting, welding, etc.) is being powered by the laser beam. The intensity of the laser light can be continuously monitored while processing is ongoing. All very good in principle, but just how much force are we talking about? The momentum of the beam of light changes direction when it reflects from a surface. Reaction to this action tells us that the surface gains equal but opposite momentum to the change of momentum of the light. If a watt of laser light reflects from a highly reflective surface at an angle of 45 degrees, the force that is exerted on the surface is roughly equal to the weight of half a microgram on Earth. This is about the weight of a fine grain of sand. Small, and yet not too small. Rugged laboratory scales having weight resolution as small as 0.1 microgram can be bought off the shelf. To test this laser power measuring method, the NIST group teamed with engineers from Scientech, a commercial company making rugged weighing scales and laser measurement devices. They provided an off-the-shelf top loading balance with a resolution of 100 nanoNewtons (10 ug.) The laser mirror is affixed where the platen of the scale is usually mounted. The design of this scale allowed it to be turned on its side so that the laser optics could be distributed on a horizontal plane. The NIST team then attached a 25 mm diameter front surface dielectric mirror onto the vertical shaft of the scale. The optical absorption of the mirror was less than 0.3 percent at the operating wavelength of the NIST laser, so that cooling the mirror was not a concern for these experiments. The NIST ytterbium-doped fiber laser used can provide up to 530 watts of laser output at a wavelength of 1.07 microns. At full power, they were able to deliver as much as 3.5 uN (0.35 mg) of force to the mirror. The experiments showed the expected linear relation between measured force and laser output. Having confirmed that the radiation pressure approach to measuring laser power worked up to 530 watts, the NIST team tried the same rig out on a 100 kW CO2 laser. To put this into perspective, this is considered the entry level power for military missile, aircraft, ground, and naval targets. A 100 kW laser beam is quite large, about 10 cm (4 in) in diameter, and would not fit on the original mirror. In addition, the reflective coating on the original mirror did not function well at ten times its design wavelength, so that mirror was replaced by a 20 cm (8 in) diameter gold coated silicon wafer, which absorbed only 0.2 percent of the incident light when illuminated at an angle of 45 degrees. The resulting force was about 0.7 milliNewton, or the weight of 70 mg of mass, which was successfully recorded by the experimental meter without significant signs of overheating. In particular, there was no sign that radiometric air currents were affecting the power readings. The effect of such air currents are often mistaken for radiation pressure, for example in a Crookes radiometer. The NIST group were able to measure laser power ranging from 50-100,000 watts using a single simple technique. Only the mirrors had to be adapted to the different laser wavelength used in the study. The measured results showed both measurement noise and the total measurement uncertainty to be several percent, a figure that could easily be improved in a meter actually designed for measuring laser power. Radiation pressure laser power meters should be more portable and more rugged than the existing calorimetric meters, and in time may well equal their currently superior accuracy.